Loosely translated that’s Potato in Poppy Seeds and Red Lentil Soup for Lunch. Ok, that’s it, I would rather have my Alu Posto than this tough sounding dish. Posto or Poppy-Seeds or KhasKhas is a popular ingredient for several dishes in Bengal, particularly in the districts of Bankura, Birbhum etc. I don’t know whether I loved it because it “induces euphoria and sleep” but I tell you it’s yummm and if you doze off to sleep after the above lunch that’s bliss too. Grind the posto/poppy seeds to a fine powder. I use the coffee grinder which can be used to dry grind only. So afterwards I mix it with water to make a paste. The consistency of the paste should not be too watery. If you are wet grinding make a paste at one go. Cut the potato in cubes and soak in water , else they develop black spots. Chop or slit the green chillies. Heat oil in a Kadai/Pan. Mustard Oil is preferred. Add the whole Jeera/Cumin seeds and wait till they sputter. You can add 2-3 dry red chillies too. Add the potato cubes in the oil with a pinch of haldi/turmeric powder. Saute the potato lightly till they develop a golden tinge. Do not over or deep fry them. Add little water (around 3/4 cup), adequate salt, and the chopped green chillies. You can sprinkle very little sugar if you want. Cover and cook till the potatoes are done. Also I make it dry so I wait for the water to dry up. Add the previously cooked dal and mix well. Add salt, little sugar and water. 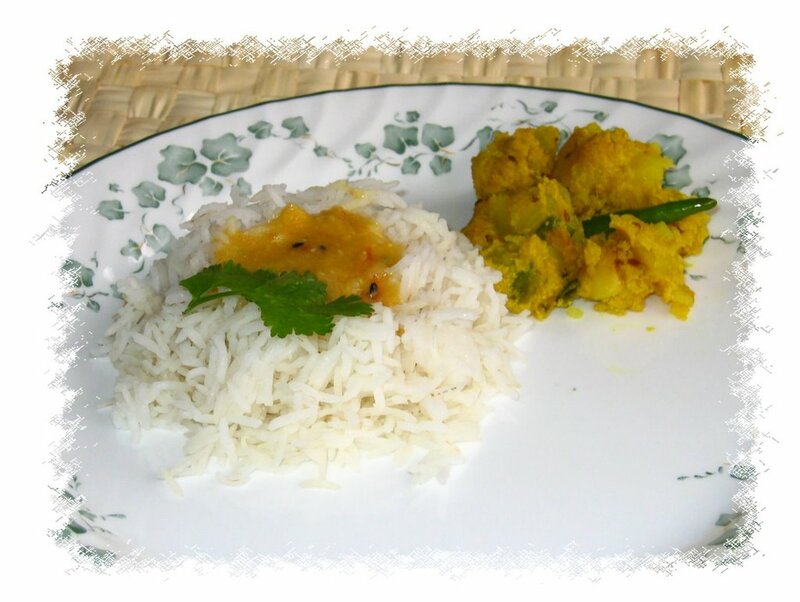 The alu posto and musur dal go very well with plain white rice. My Ma used to make Urad Dal (or Kalai er Dal ) as an accompaniment with posto. Post that another day. Updated on 3rd August, 2007: The original post did not have measures as I was still new to blogging. This post has been updated with the measure for alu posto. For the Masoor dal check my post on Red Masur Dal. just a suggestion - Mustard oil for posto is heavenly! You are right, and ka(n)cha posto bata with ka(n)cha lanka and mustard oil, still better. mmmm...a friend made this posto for me a long time ago and it was so good but she wouldnt give me a recipe - said it was a family secret. i tried your recipe and i can tell you, it was way better than hers! :) haha!!! Sandeepa here after long. Posto bong love I guess its best know bong dish. I have never had aloo posto, but am tempted by the name of it! I just bought some poppy seeds to make aaloo posto. 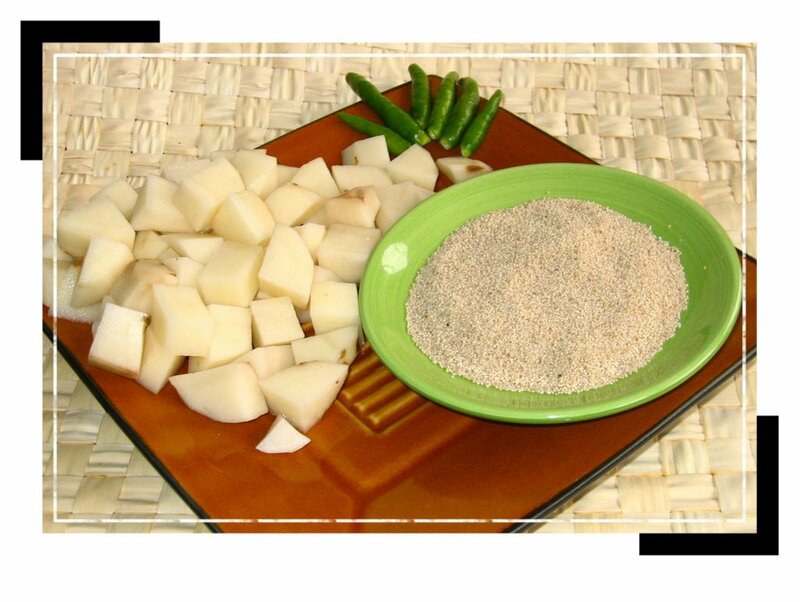 Though you have shown potatoe cubes and posto that you used in the picture. I still hope you can guide me a bit with measurement. How much (in cups) is the posto shown in the picture. hey!m a major Bong fan! !the people and the Fooooood! !i dont like the sweet taste in it..but minus that..there is something fab about it! !m gonna learna lot from u! !being a Bangalorean i feel the connection getting stronger!! Btw, why this long break..? hope its just work thats keeping u busy..miss u ! hey.. in aloo posto you should try paanch fodon that is the mixture of five seeds instead of only jeera or kalauji..these are kalaunji,methi seed.white jeera,mustard seeds and lil bit of ajwain..try this. try adding one chopped onion after chaunk/ temper panch phoron. Adds a wonderful taste to Posto. I had some leftover boiled potato and I though of trying your recipe. It came out so yummy and awesome even with boiled potatoes. If i am not wrong I believe Biulir dal is the best accompaniment with any form of posto. please reply if some one is Ghoti. I just got married a month ago and I can't cook at all! My husband is Indian and I'm American, so I have no background making Indian food. I made this for lunch today and he said it tastes just like home, just like his mom's! Thank you! Best compliment I could have ever gotten, thanks to you!! Now I need to keep practicing for when the in-laws come to visit. Revisiting this page after years, it is interesting to see how the blog and your style has evolved. Much love for all the food joy you bring to all our lives. @Jawhar - quite agree about the biulir dal deal.